Sweden took a narrow lead in their World Cup play-off as they beat a disappointing Italy side 1-0. The home side took the lead against the run of play just after the hour mark when Jakob Johansson's shot from the edge of the area was deflected in. Despite the improved performances of Serie A as a whole Italy looked short of ideas, with fans becoming increasingly frustrated with manager Gian Piero Ventura. Andrea Belotti, who passed a late fitness test to start the match, spurned Italy's best chance of the night when he inexplicably headed wide from only a few yards out, while Matteo Darmian struck the post with a sweet effort in the second half. In truth, Sweden rarely threatened in attack and there was more than a hint of good fortune about Johansson’s goal, but Janne Andersson’s side looked every bit as effective in defence as the experts Italy. Ventura will need to come up with an alternative plan to find a way through in Monday’s second leg if Italy are to qualify for Russia 2018. Italy's woes: It has been almost six decades since the Azzurri last failed to qualify for the World Cup, but Ventura’s side now find themselves with an uphill task of claiming a place in Russia next summer. It seems unthinkable that a World Cup could be played without Italy, but there were few signs that they are capable of turning this tie around. Alarm bells should have been ringing after a disappointing qualifying campaign – a 3-0 thrashing at the hands of Spain was followed by an unconvincing victory over Israel before an unforgivable home 1-1 draw with Macedonia. It feels like Ventura has no idea how to arrest the slide. The 69-year-old is old enough to remember when Italy didn’t qualify for the 1958 World Cup – he will not want to go down in the history books with Alfredo Foni as only the second manager not to guide the Azzurri to the finals. Andreas Granqvist (Sweden): Led by example at the heart of Sweden's defence. Kept the likes of Ciro Immobile and Belotti fairly quiet throughout. Italy: Buffon 7, Barzagli 6, Bonucci 6, Chiellini 6, Darmian 7, Verratti 6, De Rossi 6, Parolo 6, Candreva 6, Immobile 5, Belotti 5. Subs: Insigne 5, Eder 6. 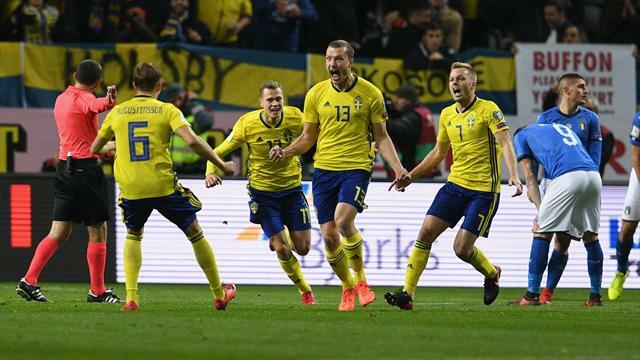 Sweden: Olsen 7, Krafth 7, Granqvist 8, Lindelof 7, Augustinsson 7, Claesson 7, Ekdal 7, Larsson 7, Forsberg 8, Berg 6, Toivonen 6. Subs: Johansson 7, Svensson N/A, Thelin 5. 6’ - WHAT A MISS! Darmian drives to the by-line before curling an inch perfect cross onto the head of Belotti... but he somehow directs his header a yard wide of the post from a few yards out! 25’ - OVER! Toivonen sets up Forsberg with a perfectly weighted pass, but the Sweden midfielder curls his first-time shot over the bar. Janne Andersson, Sweden's manager, has his heads in his hands. He knows he should have done better. 28’ – YELLOW CARD FOR VERRATTI! A minute after producing a moment of genius, Verratti goes into the book for a needless foul meaning he will miss the second leg. 61’ - GOAL! SWEDEN TAKE THE LEAD! Extraordinary scenes in Stockholm as the hosts take the lead! Johansson, only on as a substitute, sees his half-volley take a wicked deflection which wrong-foots Buffon and into the back of the net. 69’ - OFF THE POST! Darmian takes a touch to set himself up for a shot from 25 and his effort is sweet as a nut, but he is agonisingly by the woodwork with Olsen rooted to the spot. Italy have scored only three goals in the last five matches and haven't found the net in two of these. Ventura's side fired only one shot in the first 45 minutes of play - only against Spain (October 2016) they fired less shots (0) in a first half of these World Cup Qualifying. Daniele De Rossi overtakes Andrea Pirlo (116 caps) as the fourth-most capped player for Italy (117 games). Jakob Johansson scored his first senior international goal on his 14th cap - four minutes after coming on as a substitute.